The painter, designer and poet Pierre Alechinsky (1927-) was born in Brussels. With his fellow-poet Christian Dotremont he founded the so-called “Cobra” (Cologne/Brussels/Amsterdam) Group, which set out to replace the existing confrontation between abstract and representational art with “Baroque Expressionism”. At the same time Alechinsky forms part of a recognisable artistic tradition: not only that of Paul Klee, but of Surrealism itself, from which he took a sense of mystery and the spontaneity of automatic drawing. His canvases are painted with an organic exuberance, filled with a world of grotesque figures in a state of constant flux. 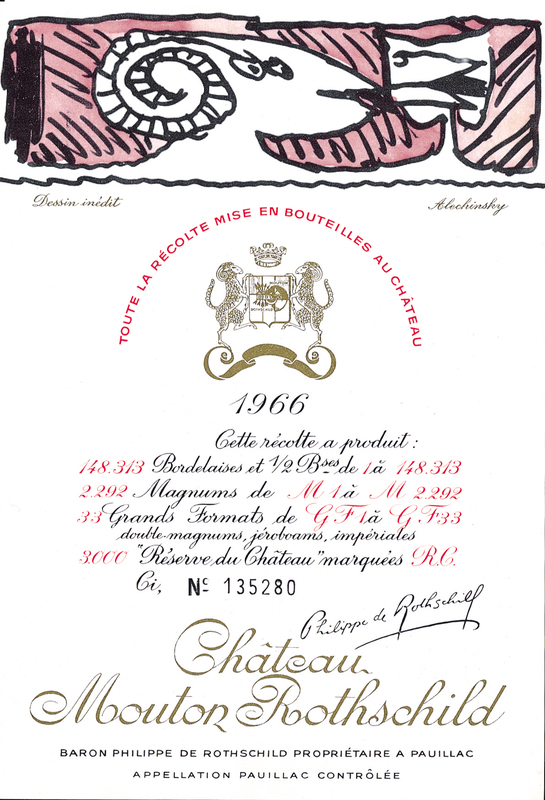 Powerful but full of humour, his allegory the “Ram-Drinker” for the 1966 Mouton Rothschild label seems almost to leap off the bottle.